A book for everyone who is, was or has ever wondered what it is like to be a 15 year old boy! 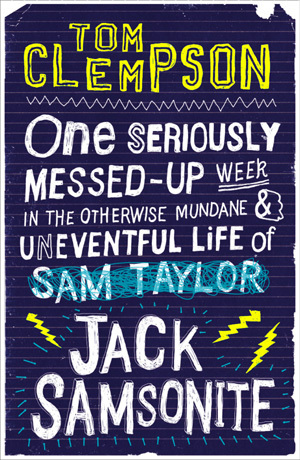 One seriously messed-up week in the otherwise mundane & uneventful life of Jack Samsonite is being billed as a cross between Adrian Mole meets The Inbetweeners. It is also the only book I have had to stop reading on the underground as I was laughing too much in between cringing at the memories of my teenage years it was dredging up. I am seriously in awe of Tom Clempson, the man is a genius with the pen! He has captured the awkwardness and uncertainty of being a teenage boy perfectly, combining crudity, romance, confusion, lust, friendship and the desire to get through the day without being bullied into the package of Jack Samsonite. The story starts on a Monday – with nob ache. Which, if I remember my teen years correctly, (and believe me there is not a man alive that does not – no matter what we may say. We remember every embarrassing moment clearly) is how many days start for boys in their teens. Read this book, gain some insight into the mind of a teenage boy and perhaps you will even sympathise with them the next time one of them really pisses you off for just being a teenI read it and loved it (unconditionally) for the laughs, the angst and the cringe-worthy memories it evoked. I was Jack without being cool but then most of us were in those days. *gasps* I actually blushed and nearly covered my eyes from embarassment just reading your review!I think this book sounds like it'd be incredibly funny/awkwardly embarassing and your review actually really makes me want to read it despite the fact that I would probably squirm all the way through it!